I have a really bad relationship with McDonald’s. I’m that kind of person that if forced to eat there, orders the side salad and the fruit bag. Then, with the almost empty tray, looking miserable, prays to be out of there as soon as possible. Yeah, that would be me, and I really look miserable in these rare occasions. I had loads of fruits at home, so I decided to have some fun and play with the ingredients a little more than I normally do. I wanted a cool but tasty burger, and french fries. Of course fries ( I mean, what kind of Happy Meal is, if there are no fries??). I mixed some mango with coconut, agave and mint for a fresh and sweet burger. 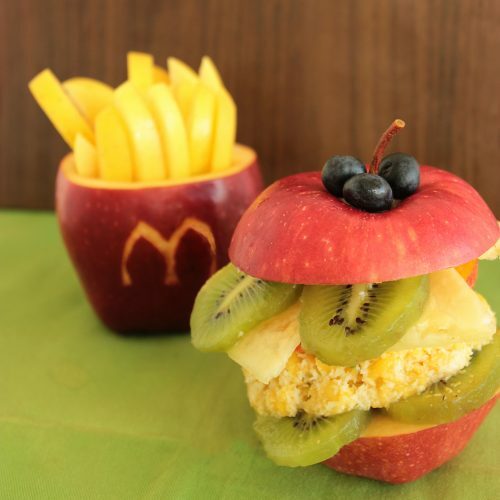 I added some kiwis and pineapple to give a little tartness, and I made the fries out of a golden apple. Come on, I deserve to be called Genius for at least once in my life, and probably this is the time!! I hope you really like it and will try this at home, will surely be a WOW dessert, yet so easy and simple to make! Make yourself happy, and enjoy your Happy Meal! In a bowl, mix mango cubes together with mint leaves, coconut and agave nectar. With your hand form a pattie , just like an hamburger. Slice off the top of one red apple and discard. Spoon some of the pulp out of the apple and drizzle with 1 tsp of lime juice. Cut the golden apple into sticks and arrange inside the red apple. Drizzle with orange juice and sprinkle with brown sugar. Rest in the fridge while you make the burger. Slice the top off the second apple and set aside. Slice off the bottom as well. Use the middle part for another recipe. Drizzle the bottom of the apple with a tsp of lime juice and arrange 3 kiwi slices on top. 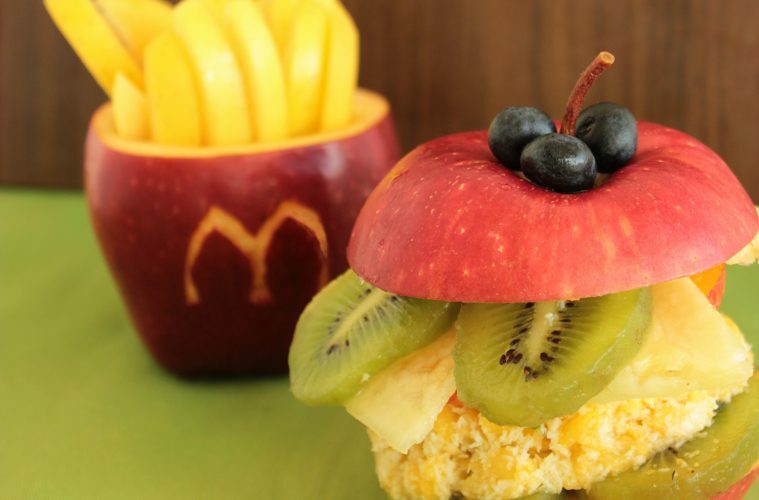 Transfer the mango burger on top of the kiwi slices. Place the nectarine slice on top and sprinkle with pistachios. Place the pineapple strips above the nectarine, and arrange the remaining kiwi slices on top.